Be it a simple French manicure or an elaborate design with rhinestones and foils, having a manicure kit with an assortment of nail art supplies and tools is essential. There are many places online to find everything needed to customize a nail art kit for beginners and professionals. Amazon: Amazon carries most items needed for a complete nail art kit, including polishes and quick-drying manicure spray. Most orders are received within one week, are eligible for free shipping, and Amazon will accept returns. This site also allows the customer to re-sell the item on their website or trade it in. Sally Beauty Supply: This store and website carries a wide array of nail polishes, embellishments and glitter, as well as quick drying manicure spray. Prices range from about $1 to $25. Most items can be found in store; if ordered online, shipping charges start at $5.95 and ship within one week. 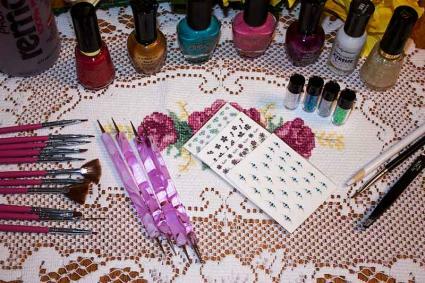 At a minimum, every nail art kit must include nail polish, brushes and various embellishments. Regardless of how elaborate the design may be, any nail are kit should contain a wide array of nail polish colors. Sally Beauty Supply has a wide array of nail polish of all types. You can use regular or gel polish for nail art. Several nail polish manufacturers have come out with a line of air-dry gel polishes. Most come in the same colors as their regular polish line. There are also gel polishes that require a UV or LED light to cure or dry each polish coat. While the lights are expensive, the durability of the polish is much more than regular polish or the air dry gel polish. Basic nail polish colors: A basic color palette is essential to any nail art kit. These colors include red, yellow, blue, green, purple, black, white, and brown. Sheer pinks or neutrals are also needed for French and American manicures, which is a perfect background for any nail art. Accent colors: Metallic polishes and glitters are needed to accent nail art designs. They can be mixed with base colors to add a subtle shimmer or applied on top of the base color. These accents are versatile and come in a wide range of colors. Most popular are gold and silver. Nail art pens are typically used as accent colors. Top and base coats: Top coats and base coats are essential for the durability of any nail design or polish. A quality base coat ensures that the nail surface is smooth and that the color coat adheres properly. A quality top coat will seal the design. Regular polish top coats come in both a shiny finish and a matte finish. Along with an array of polish, a complete nail art kit needs several nail art brushes for freehand designs. The basic brushes include a striper brush for thin lines, a small detail brush for intricate designs, and a dotting tool. A complete kit would have many more brushes, such as a fan brush for blending. While Sally Beauty Supply has individual brushes, a full set of brushes can be purchased on Amazon for less than buying them individually. 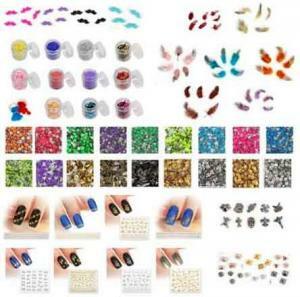 Dollar Nail Art: Used by many professionals, Dollar Nail Art carries a wide variety of rhinestones, charms and decals, including transfer foil. Items are $1 each, and can also be bought in sets for about $15. While this website offers the most product for the least amount of money, the minimum order is $25. Shipping charges start at $6.95 and orders ship within one week. This company does not list any information regarding returns on their website. They do, however, give contact information for phone, fax, and mail. Light in the Box: This website carries everything needed for a complete nail art kit from polish to stickers to basic tools. Supply prices start around $2, and most qualify for free shipping. To return items, contact Customer Service to request a return. Once the request is reviewed, a return form will be sent to be placed in with the item to be returned. Upon receiving the returned item, Customer Service will take steps to issue a refund or replacement. Walmart: Whether online or in store, Walmart carries a variety of stickers, embellishment sets, and nail stamp sets priced from about $3 to $20. Items can be shipped directly to a home or business for a small fee or shipped to the closest store for free. Items can be returned to any store or by mail within 90 days of purchase. Items purchased from a Marketplace vendor must be returned to the vendor and not Walmart. Charms: Nail charms come in a variety of shapes and sizes. There are 3-D nail charms which are tiny resin sculptures that can be glued to the nail. Flat nail charms are typically thin metal pieces that lay against the nail. Dangles: Nail dangles are charms that hang from the nail through a small hole in the tip of the nail. The nail dangle consists of a small loop which is attached to a jewel, bead or charm. A jewel drill is used to make a small hole in the nail tip to attach the dangle to the nail. Stamps/stencils: Stamps and stencils use a contrasting or accent nail polish for the design that is placed on the nail. Note that nail stencils are typically used with air brush designs. Stickers: Available in a range of designs from simple, single flowers to elaborate tattoo-looking designs, stickers can be found at most stores that carry nail polish. Decals: There are several types of decals, including transfer foil, strips of lace or ribbon, striping tape and nail appliques. Transfer foil adheres to nail polish before the top coat is applied. It comes in a wide array of colors and designs. Lace or ribbon must be applied with nail glue. 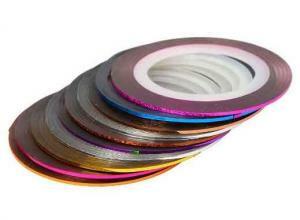 Striping tape is like a sticker and self-adheres to polish. Nail appliques are UV-cured, nail-shaped designs that can be cut and applied over a color coat or applied in whole to the natural nail. If applied to the entire nail instead of polish, no base coat is needed. For the serious nail artist, consider investing in an airbrush gun and accessories. Airbrush guns use special paint for nails. An airbrush provides the ability to create elaborate and stunning designs on nails. Airbrush guns and accessories are rather expensive, and can be bought separately or in kits. The Master Pro Nail Art Precision Dual Action Airbrush Set sold at Amazon has everything needed for nail design. It is about $90 with free shipping, and reviews show expedient shipping time. Whether you're a beginner or professional, beautiful nail art is only limited by the imagination. Always try the design first. 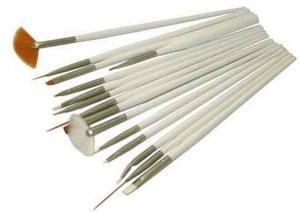 Artificial nails glued to wooden cuticle sticks are an inexpensive way to practice and come up with new designs.